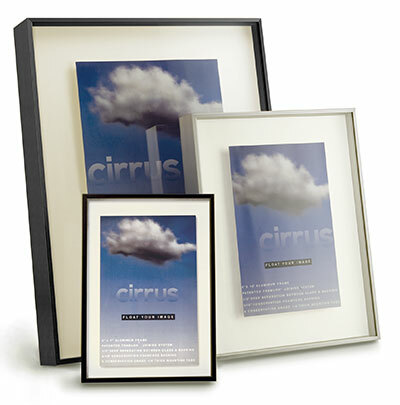 The aluminum Cirrus is a 1/2” deep “shadow box” frame frame that fits the bill when framing dimensional artwork like scrapbook pages. However, “floating” an image in a Cirrus frame, rather than using a mat to separate the glass from the art, gives extra dimension to any two-dimensional image as well. “Float tabs” are in included. Cirrus uses the same FRAMLOK™ system as the Fineline.